I've started recreating the whole overworld not too long ago, decided I'd make it a sequel to Parallel Worlds instead of that Earth idea (yeah I change ideas quite often). Various areas are looking nearly similar, except it's 500years later so you can except to have roads and other modern things around but the layout is pretty much the same. I see more Pokémon edits in there than you'd expect in a Zelda hack. But they actually look fine in context. Last view: 2657 days It's been a while since I've posted an update on my hack. 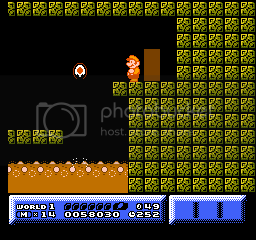 I just want to say I haven't done very much on it in the past month, but here's a few screens of my 2-1, my first fully original level. 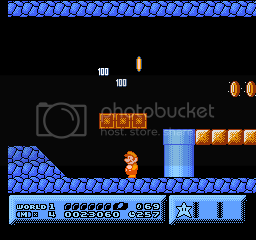 When I get closer to completion, would you mind doing some sprite redesign for me? I'm asking since you're a lot better at it than I can hope to be. Last view: 74 days @SePH, you deserve to win. Looks nice, Trelior. 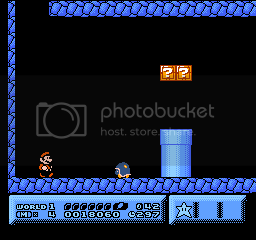 One extremely minor nitpick I have is that in the first two shots, the player can get "stuck" up in that area with the 1-up question block if he's super. 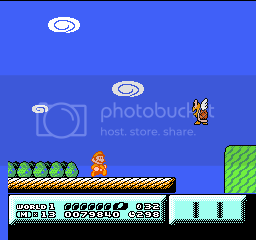 I know it's really no big deal to duck-slide out of it, but I would put the one-up block somewhere off to the side so that the duck-slide doesn't have to be used in the event the player gets up there (instead making the player have to jump up into the box to get it). That's just me, though. And I'm sorry, but I'm gonna' have to give you a very uncertain "possibly" on your request. I wasn't even planning to redesign the sprites in my own hack (except maybe convert two or three smaller ones to something else) and I really don't have the patience or imagination of someone like Icegoom to completely redraw the sprites. We'll have to see what happens, though. I'd have posted my underground set graphics, as well, but I'm not satisfied with them (and I spent like two hours on them, too. Yeesh), so they'll be getting another makeover before I toss them up here. Last view: 92 days Damn man your graphics work is awesome. Thanks, RetroRain. 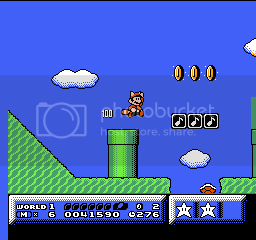 I'm trying to jazz it up as much as I can while still keeping that Mario 3 feel. I'm happy with the way it came out, but I spent a long time on the lava...and I'm not completely satisfied with its animation, so it might change in the near future. 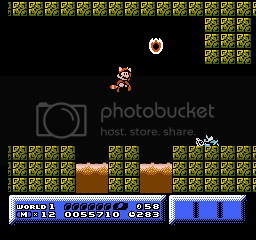 The door in the final shot was added as a suggestion from Quick Curly (Boom-Boom sprite issues could possibly arise, otherwise). Thanks again. Last view: 1084 days Mineyl... it would be really cool to see you do some graphics for me. ...actually, that pixel you're talking about was a mistake. I'm a little surprised I didn't catch it earlier... I'll be fixing that, so thank you for pointing it out. Thank you. I'm glad you like 'em; both the blocks and the windows. :3 The windows actually had a different and more gothic look to them before, but after I found out that the middle block of the TSA repeats when you stretch the windows vertically, I had to alter it to what you see there. Luckily, they still look presentable. Mineyl... it would be really cool to see you do some graphics for me. Well, I can try. I'll have to get back to you on that, though. Art isn't really something that a person just does, you know? It has to come to ya'. The only reason I'm able to churn this stuff out at this rate is because I've had a mental image of what I've wanted to do with many of the graphics for a very long time locked in my head, so it's all flowing forth at once. If I do graphics for you, it'll probably be a few months after I've finished my own (not necessarily the whole hack; just the graphics). As for working for Nintendo... 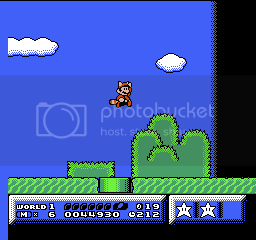 I'd love nothing more than a complete revival of 2-D Mario titles that aren't rendered in 3-D graphics, but game companies seem to have this thing about using exclusively high-tech crap for their flagship series these days. *rolls eyes* I'd go on a rant about how 2-D > 3-D right now, but I'll spare you that. The palette in your screenies looks very...freaky, but I like it anyway. 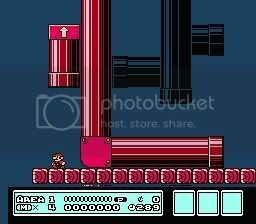 It's nice to see pipes in SMB3 that aren't green. Last view: 92 days I love your graphics work. How do you do it? 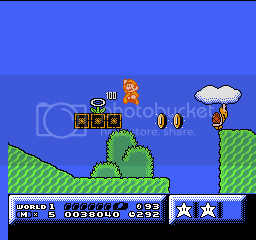 I was trying to do some graphics work for SMB3 the other day, but I plain and simply FAIL at it. You have any tips on how to do good pixel art? Sure thing! I'll give you a general overview of how I do this, as well. -- Always create the graphics in an external program. 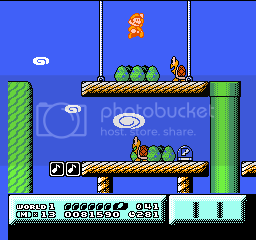 Drawing pixel art in YY-CHR and trying to keep everything in order so it appears correctly in the ROM is a nightmare. I use Paint (yes, MS Paint) and iDraw 3 Chara Maker, a very old program that was given out on an RPG Maker website specifically for creating sprites and graphics in a 256 or less color limit. -- I try to shade everything in a pseudo-oekaki style. 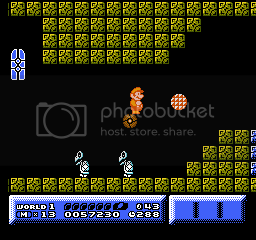 You may see this technique in other hacks such as Luigi vs. Mario. It's a very good way to trick people into thinking that there's more than two or three colors making up an object. 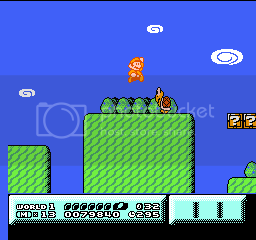 -- When converting your graphics into YY-CHR, try to keep the palettes consistent to avoid confusion and make sure that everything pastes cleanly into it. It has a bad habit of replacing colors when you don't want it to...feels kinda' random, really, so I can't very well help you on that. As for actual graphics placement, replace each 8 x 8 line with hex digits (or letters or whatever) and check out what's changed in the game so you can get a feel for how the TSA is put together and so you can make the necessary changes if a certain block is repeating that you don't want to. -- Be patient! No one paints a masterpiece in a day, and certainly no one begins one on demand alone. Let the art come to you instead of trying to force it, because if you do the latter, odds are you'll be unsatisfied with it unless you're a naturally talented artist (in which case it may be passable to the average person). -- When in doubt, look at the graphics from other games. 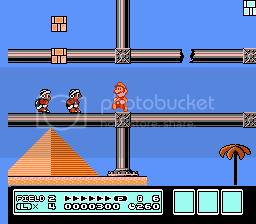 Some of this stuff we take for granted as pitiful and inferior NES and GB graphics are actually very well thought out patterns to meet the confines of the technology. You can learn a lot from getting a feel for how the professionals put together their stuff. Last view: 108 days I personally prefer Tile layer pro, but, if you want something that you don't have to edit 1 part of the Tile at a time, I recommend Mr Click's Tile Ed. It took me forever to figure it out, and it doesn't show the address in hex, but decimal instead, and the palette thing is a little obnoxious to figure out, but, once you figure it out, it's not that bad of an editor. I think if I gave it time, I think I'd probably prefer it more. The pixel-artists call this technique "dithering" - it's an absolute requirement if you have to work with a limited palette. And thanks. 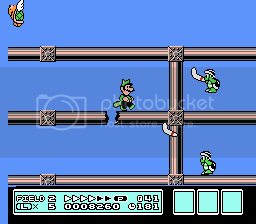 I spent a lot more time than I'd like to think about trying to get the underground to look right (if you'll notice, I've been doing these in the order the levels appear in my hack, so I actually skipped over the underground after its first redrawing so I could think of some way to actually make it work). I think I'll be posting my sky set soon. It's sitting at about 70% completion! Ah! Well, someone's showin' me up with a promising hack of their own! Very nice. Looking forward to it. 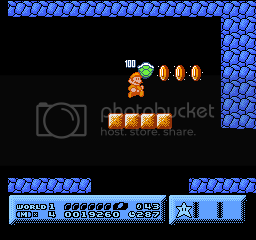 Maybe I'll have a few more graphics to show as I continue on with my hack. Technical issues are slowing me down, though. I want to get through them for now so I can start my second world. I don't think I really want to "show you up," KP. 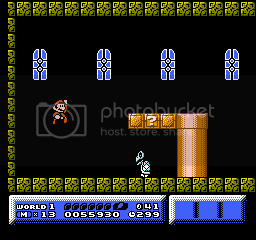 Level design and graphics will probably be the extent of my SMB3 hacking, whereas I love what you did with some of the music samples in yours (particularly the castle clear song; it sounds 3000% better with that different main instrument!). I enjoyed watching the video of your hack and I am very much looking forward to its release. And hey, you're the one who inspired me to finally start hacking the graphics in my project, so a big kudos to you. Not to mention my hilly stage bushes are inspired by some I saw in your hack (though I went out of my way to design it differently enough that it doesn't look like a blatant copy). Time for sky set screenshots! I know you don't want to show me up. 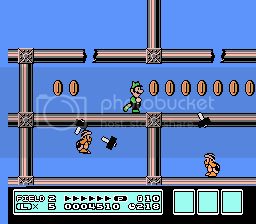 All I'm saying is that I'm glad there's enough SMB3 hacking activity going on that mine, yours, and several SMB3 hacks are being made right now. 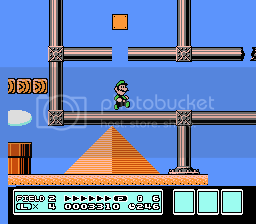 Level design sometimes is hard for me. 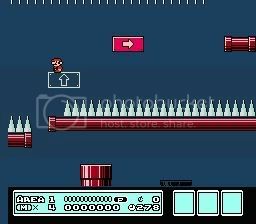 When making levels, I sometimes lose creativity and make an incredibly dull level. I often have to retrace myself and rebuild the level. 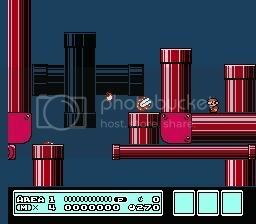 One of these days, I'd like to build a visual map of where SMB3 levels are and what type of levels they are so I can strategically pick which ones I want to overwrite if I need to overwrite any. MySQL - queries: 112, rows: 152/0, time: 0.121 seconds.